A Major Power Threatens Israel's Way of Life - Against the minor powers, the rallies led by the judges had ended in victory for the "chosen ones." Now Israel was threatened by a major power, Philistia. Would leadership under a judge be adequate to meet this danger? Philistia: A Well-Organized Military Unit - Twice subdued by judges Shamgar and Samson, the Philistines had then only been a minor power. Things had changed a few generations later. The development of iron weapons and a heavily armed and well trained army of formidible size had the Philistines enviously eyeing the rich inlands of the Hebrews. Philistia struck Israel's forces encamped at a site called Ebenezer and the chosen of God suffered humiliating defeat. Philistia Captures the Ark of the Covenant - The Israelites concluded that this humbling defeat was the "predictable end" of having entered a foray without God in their midst. Quickly they ordered that the Ark of the Covenant be brought up from Shiloh. The presence of the Ark made no difference. Israel was defeated again and the Ark was captured by the Philistine army. The living were left but nothing but broken dreams. The loss of the Ark meant that even God had abandoned his people. This was Israel's darkest hour. Dreams of the Monarchy - The power displayed by the Philistines caused the Israelites to plead for the establishment of a monarchy. Many maintained that Israel must have a king to unify the twelve tribes into one powerful body. Otherwise, Israel would remain forever vanquished. Israel chose the path of strong organization. In the face of Philistia's overwhelming power, the confederacy gave way to a United Kingdom. Massive army posed in background - Israel was threatened by a major power, Philistia. Warriors with iron weapons - Philistia was a well-organized military power and, as such, was substantially different from Israel's former enemies. 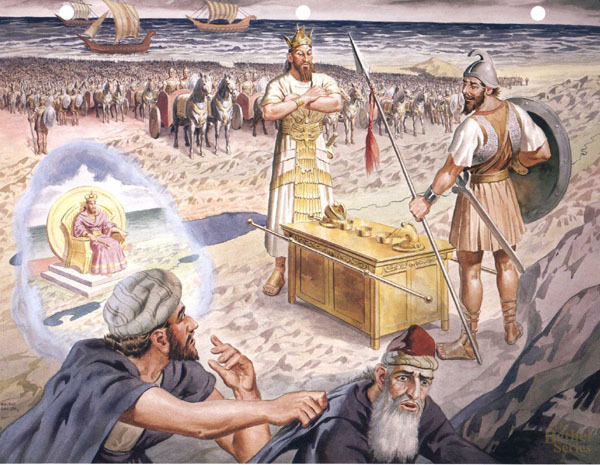 Gloating king and arrogant warrior standing over object - Philistia captures Israel's most prized possession - the Ark of the Covenant. Figure in foreground with tears in eyes - The loss of the Ark created the feeling among many in Israel that their plight was hopeless. Figure in foreground clasping cloak of weeping man - Others in Israel saw a resolution of their crisis in a change of governing procedures. Vision of throne occupied by king - Israel's humiliation by the Philistines led to the conception of a central government ruled by a king.